Wobble Wedges Thread Inserts: HeliCoil or Time-Sert? Chances are you’ve seen a wheel lock, sometimes called a boot, on a car that’s violated some parking ordinance — if not in person, at least on TV. The concept is to make the car stay put by completely immobilizing one of the wheels until the owner pays a fine. The Wheel Chock Lock from Curt Manufacturing uses the same concept to keep your trailer or camper from disappearing, only now you have the key. The Wheel Chock Lock will expand to fit a variety of tires. It has a powder-coated yellow finish to resist corrosion and make it stand out. 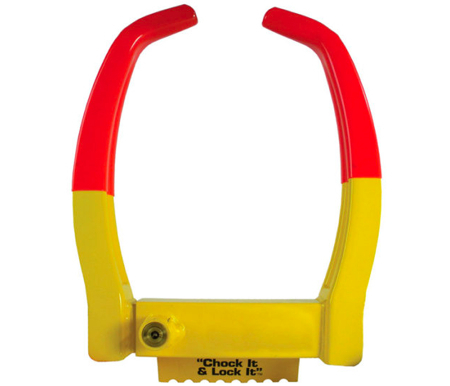 The Wheel Chock Lock comes with three keys and runs about $75. This WOULD be useful if only it included a disc attached to one side of the chock to keep people from just taking off the wheel in question and making off with that trailer. I agree with Heywood. Not much point without blocking access to the lug nuts, especially if you happen to have a trailer spare bolted to it somewhere. just get some simple locking lug nuts.. done and done..